When is a Clown Not a Clown? Britain has a rich, varied, and evolving tradition of clowning, from Shakespeare’s contemporary Will Kempe to Hollywood legend Charlie Chaplin; from the oft-cited ‘father of modern clowning’ Joseph Grimaldi, to current pre-school superstar Justin Fletcher (aka Mr Tumble). The word can encompass a whole raft of varied, talented performers and yet here in the UK, clowns face considerable prejudice. Britain also has a rich, varied, and evolving language, and much of the problem seems to stem from the fact that the words clown and clowning have parted company under present usage. In general public reception, clown conjures specific images, of heavily made-up, bewigged, inhuman characters; clowning is more readily accepted as the mode of behaviour that brings these visual spectres to life, and can equally be applied to more ‘normal-looking’ personae. We rarely call ourselves a group of clowns publicly, even though that’s what we do. Perceptions and branding can be a big issue. It’s the connection with the audience and engagement that is essential to us. To performers familiar with the clowning tradition, this may be a given; to the layman on the street, however, the explanation is all too often necessary. Imagine a world to whom ‘a painter’ was someone in overalls and old jeans who whitewashed the walls of your home. Now try and imagine the difficulties of explaining that you paint Other Things. That you create designs, beautiful, ambiguous, grotesque, abstract or realist. That you use a range of colours; nuanced tools; that you are an artist, communicating something of the human experience through your work. That is the challenge our clowns are facing today. Even if what I do on stage is definitely clowning – and not acting – I tend not to use this word because many people don’t know what contemporary clowning means. And that’s normal! I didn’t know before I leapt into it. What I do is not ‘traditional clowning’… and I need my audiences to know it, otherwise they wouldn’t turn up! Morel also works for the UK branch of an international charity (as do I), visiting children’s hospitals as part of a specialised team of experts who engage young people and bring joy and lightness to the clinical environment. For a charity, the fashionable antagonism towards the word clown and its current associations can be even more problematic. The work uses key tenets of clowning – improvisation, spontaneity, a sense of ‘being present in the moment’, and a genuine human connection – within the sensitivity of a hospital environment (and often also includes elements of music, storytelling, magic, puppetry, depending on the artists’ own strengths). The experience is vastly appreciated by the 1000s of people visited each year across the country; nevertheless, it is that word clowning that can often put potential donors on the wrong foot. Without donations, a charity cannot exist, and all the good they do could be lost because of a misunderstanding over a word. The difficulty, of course, is the distance between the public stereotype of clown in the UK, and the work itself (when I’ve spent time abroad, I’ve found attitudes very different). To me, a clown is not an image, but an open soul. Not someone who tries to force humour regardless of the situation, but someone who allows their human frailties and natural ridiculousness to be seen. Not a ‘look’, but a way of being. This art of clowning is difficult. Far harder, and very much removed from acting. A good clown is totally present in the moment, vulnerable, and in genuine connection to the people and world around them. I think it is this difficulty – and sometimes a lazy reliance on external image over true skill in the commercial environment – that has lumbered the world with bad clowns (and even non-clowns who dress in the familiar garb thinking that is enough), who have lowered the reputation of the art so far. Just as you can clown without make-up, you can certainly wear the make-up without being a true clown in the active sense. 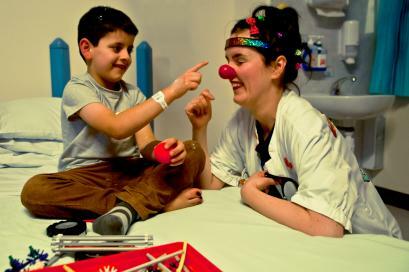 The idea of a red nose may provoke analogous images of old-fashioned circus clowns or deliberately scary celluloid villains but, in hospitals for example, the reality of the nose provides a valuable tool in reaching young people with numerous illnesses and impairments, from a medical as well as an artistic perspective. That something so small could prejudice potential charitable funders to reconsider their donation is mind-boggling. If I thought the emerging forms of circus had an identity crisis, it’s nothing compared to the battles faced by those who make a living from clowning, but can no longer feel confident to call themselves clowns. It may be a matter of semantics, but the significance is a deep cultural impact for UK arts. Tagged as arts journalism, Clown, clown doctor, clowning, coulrophobia, culture, hospital, le navet bete, Performing Arts, prejudice, uk. Why do some clowns want to discredit some other clowns? As with most binary oppositions, this claim that the two sides possess opposite characteristics is not the end of the story. One side will be awarded the privileged status, the other denigrated. Value is ascribed to one side at the expense of the other. In this case, the first group is deemed ‘true clowning’, and superior as it is supposed to characterise the qualities of clowning known ‘to performers familiar with the clowning tradition’, whilst the second group are denigrated as ‘bad’ or ‘non-clowns’, and are known ‘to the layman on the street’. This baddies vs. goodies value judgment is then completed by claiming that ‘many people don’t know what contemporary clowning means’. This divides the population up into those (the public, the majority) who ‘don’t know’ and those (the performers, the minority) who ‘know’. This leads to some ‘finding it terribly sad that the word [clown] has become so misunderstood’. Personally, I find it ‘sad’ that some clowns like to criticise other (unnamed) clowns based on nothing more than having a different aesthetic to them. Actually, rather than sad, it makes me mad. This kind of dismissal of others is widespread in some parts of the clown world. It is rarely countered, maybe because those who are dismissed have little interest in attacking others just because of their different approach. In my personal opinion, this lack of attack is a sign of good clown values. However, as someone who not only performs but also writes and analyses clowning, I feel compelled to make these points. The ‘just because’ argument works both ways. Saying it doesn’t make you a clown just because you ‘dress in the familiar garb’ might sound reasonable. But I could equally say: it doesn’t make you a clown just because you don’t wear clown make-up, or just because you have trained with such-and-such a teacher, or just because you believe that the ‘key tenets of clowning are improvisation, spontaneity, a sense of being present in the moment’. But I won’t bother arguing that, since to claim superior clown-ness by these means is pointless. I can only judge the quality of the clowning on a clown-by-clown basis. Otherwise, I could say that, given that a large number of the type of clowns who claim greater truth who I have seen have also been extremely mediocre or bad clowns, then I would be justified in claiming that all these kinds of ‘truth-claiming’ clowns are bad. And that would be ridiculous. So, if you want to criticise some clowns, please do so on an individual basis, giving reasons. Otherwise, this is nothing but snobbery. Co-founder of Escola de Clown de Barcelona and author of ‘Clown: Readings in Theatre Practice’. Hi Jon, thanks for your comment – I think it’s good to get people talking around these points! My intention was not to split into two types of clown (other than acknowledging the fact that there are both good and bad clowns working, regardless of style), but rather to highlight the difference between an image and an activity. The visual picture received by most people in the uk when they hear the word ‘clown’ is completely unrelated to the realities of clown performance, which is non-image specific. Just as I say a clown doesn’t require make-up, it goes without saying that they can use it. I don’t consider myself a clown, because I don’t think I have the talent for it, despite ‘training’. Nevertheless, I do wear a nose-tip when I work in hospitals, I do wear face-paint (although this is minimal due to the setting), and I do use elements of clowning when I can. I have colleagues who fit the stereotypical image both more and less than I do, some who consider themselves ‘clowns’, and some who only see that as an element of what they do. I agree that the aesthetic should have nothing to do with the appraisal of an individual clown’s performance! I’d also be really interested to hear your views on what are the ‘essential’ ingredients that make a good clown? Just as there is very little consensus on what ‘circus’ is, it seems that there are also many differing opinions on ‘clown’, and it would be great to open up more discussion about this? I definitely agree that these issues should be discussed and I’m glad you are up for that. On the good/bad clown issue: even if you are not making those judgments yourself about which clowns are good or bad, I do think that the people you are quoting are making those judgments in the way I described in my comment before. But perhaps it would be more accurate for me to ascribe those opinions to them rather to you. On my quoting from different paragraphs: one way of revealing the assumptions of a piece of writing is to pick out keywords which seem to group certain concepts together, especially in the case of good/bad binaries. I think that the accumulation of those terms throughout the text is what potentially steers the reader’s view towards agreeing with those value judgments, almost without realising it. So I wanted to point that out, so that we can see what’s going on with those assumptions. I used the exact words from your writing in each case, placing them in two lists. That’s just my analysis, which of course you can disagree with, but I would say the method is valid. Moving on from that, I’d say that there is a key assumption here which I don’t share, which is stated in that quote you give: ‘The difficulty, of course, is the distance between the public stereotype of clown, and the work itself.’ I don’t see that as a difficulty, even if there were such a distance (which I don’t really believe there is). That’s really the point I wanted to make! What are the essential ingredients of clown? Well, that’s a huge discussion. We had a very long thread on that in the facebook group Clown Theory, I should have a look through again before getting into that one! Just been over to visit the Facebook group you mentioned and there are some brilliant discussions going on, so thanks for sharing! I think that the ‘distance between the public stereotype of clown, and the work itself’ – which I do believe exists 😉 – is only a difficulty when it comes to marketing and promoting work. Particularly if charitable donations of 10s of thousands of pounds can hinge on a photograph! For the artists I quoted, I don’t believe from their conversations that they were denigrating other forms of clowning, merely making a point that they feel the need to disassociate from the label because of the impact it has on people who would otherwise book and enjoy their work. This is clearly not a good state for the industry to be in! And it’s disappointing that by trying to give a range of examples around the nature of clowning, I have fuelled a binary debate on style of performance, rather than the question of public image that I was interested in. I have edited a couple of my sentences to try and make my points clearer, but am also glad to be having this discussion, and hope more people chip in! I think the essential ingredient of a clown is a funny bone. For me, the funniest men in Britain are Clive Webb and Danny Adams, a classic ringmaster and clown or whiteface and auguste double act. Danny wears a red nose and colourful suit but the funniness comes from within them – a natural anarchic sense of mischief that bursts from every pore on-stage or off, because I’ve seen other clowns do basically the same routines without being funny at all. Then there are people like Laurel and Hardy, Eric Morecambe and Mr Bean – timelessly funny clowns in actions but not appearance. So I think it’s more about funny bones than red noses. The latter are optional, the former essential. From speaking to Danny, do you know if he’s ever experienced prejudice based on the word ‘clown’ before people have even seen him in action? I think the best entertainers in any field are probably born rather than made; training can only take someone so far after which it’s who they are more than what they do. Thinking about it, warmth is probably an important ingredient. Clive and Danny really take the mickey out of volunteers and the audience generally but they get away with it because they come across as naturally loveable rather than nasty, much as a class clown will drive a school teacher to distraction with their cheekiness but the teacher will secretly have a soft spot for them because they’re basically entertaining and mean no real harm; the loveable rogue, if you will. Danny didn’t mention prejudice against the word clown but he’s minimised his make up because it’s perceived as scary to kids. Interestingly, they perform in pantomime without clown make-up but do basically the same things. Andreea Delbosq, who was on Zippos last year, by contrast said she couldn’t get into character as a clown without her nose. On another note, I was really surprised when I interviewed country music satirist Hank Wangford and he described his onstage persona as a clown. I’d never thought of him that way, but in terms of sending something up and making serious points through humour that’s exactly what he is. So maybe the element of cartoonish exaggeration and being larger than life is an ingredient of clowning – and what sets a clown apart from, say, a stand-up comedian – and the make-up and clothes are part of that. My words have been taken from a private meeting, in relation to specific areas of hospital clowning. Not only have the words I said been taken out of context, they have also been paraphrased and not what I said. They were included here without my permission. I welcome discussions on the world of Clown, but not in this manner. I’ve realised a lot from writing this post and feeling the fall-out – about ethical considerations as a writer, and sensitivities around these particular issues. My apology is public and, although I can’t undo any damage already sustained, I have removed mention of your name from the post. I had initially chosen to include the mention to show an example of the many people who do embrace the word ‘clown’. But I do see now that it would have been more respectful for me to discuss this with you directly before putting it up online. I will be more considered in my references in future. As a professional Magicianclown I love U all!! Most of my audience love Me. Because of my outfit! I have big shoes. Some of my audience have fear, because U never know, what a clown will do. And some clowns like 2 hurt in some way other clowns. Theres also a film, in which the killer is masked a clown. In USA there R clownfeartherapy. Some people don´t want Us, because We R free and open. And they R closed. And as a trainer my students want 2 be funny in the beginning. Working in their head 2 do something funny!!?? Be Urself. Be the child U were. Open up. With the nose. Shes very important. So people can see, who U R. Just wait 4 the moment. Act and react with Ur heart. A clown and a suitcase…Here’s a post where I am referring to coulrophobia by giving my personal definition of a clown as well as analyzing from what material the clown’s suitcase could be made, how it could be and what the clown could have put inside the suitcase.